With the energy and firepower that the 12 gauge has, you have one of the most versatile firearms in the world. Due to its immense capabilities, the 12 gauge is a favorite among soldiers, hunters, sport shooters, law enforcement officers, and those that need to defend themselves. 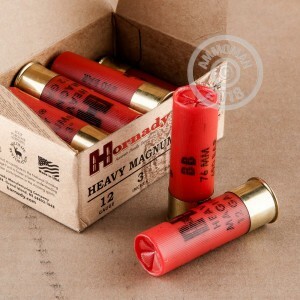 Founded in 1949, Hornady now creates some of the best ammo in the world. 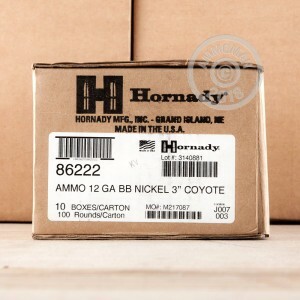 With their resolve to make high quality ammunition for all of America, Hornady ammo is reliable and consistent. 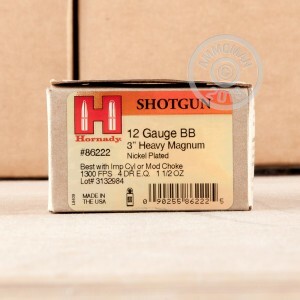 These Heavy Magnum Coyote shells measure 3" in length and carry a 1-1/2 ounce payload of BB shot. These shells have the power and pattern you need to take care of your coyote problem. Don't forget, at AmmoMan.com all orders over $99 will ship for FREE, so stock up and save!